I've been meaning to see this film since it was first released but I missed it at the cinema. Even though I'd not seen it I decided to pick up the blu-ray anyway. New British science fiction always needs to be supported and of course some of the Shaun of the Dead/Hot Fuzz team were involved in making it. Also written and directed by Joe Cornish who I've not actually heard a lot about in recent years but I was fan of The Adam & Joe Show back in the late nineties. 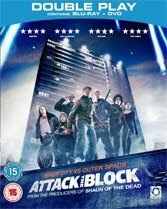 The premise is simple, aliens invade a London council estate. The problem is there isn't much more to it than that either, youths fight aliens and swear a lot. It was fun but I was hoping for something more. The one saving grace was Jodie Whittaker's character who was well acted and seemed to be the only one with any common sense. Without her the film would have fallen completely flat.